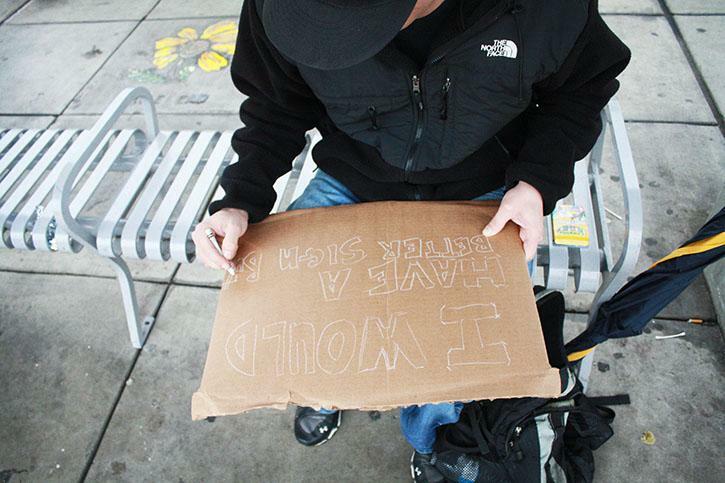 American river current co-editor-in-chief Ed Gebing works on his sign for the March in March rally. While I carried a sign at the March in March, ARC Associated Student Body Student Senate President Kenneth Hinton carried his cellphone. Hinton had said that the main focus of the march, was to lobby the state legislature, for textbook affordability. Yet on Feb. 6 Hinton didn’t attend lobby day. Instead, he sent Sen. Lori Jones and Sen. Ross Rayala to lobby on the behalf of ASB. Hinton didn’t even bother to lobby for anything while at the march. I was able to use my associated student body card for free travel to the Capitol, while ASB chartered a bus and two Paratransit busses for approximately 15 people. One of the paratransit busses was canceled due to a lack of participation from students who had previously RSVPed. I left campus a little after 8 a.m. and took one of the regional transit busses, from a stop accorss the street from ARC, which took me to the Light Rail station at Watt and I-80. As I arrived at the train platform, I was just a bit late as I watched the train leave. The next train came 15 minutes later and delivered me downtown right near the Capitol. From there, it was a brisk walk over Raley Field, arriving around the same time as the people who took the chartered bus from school. 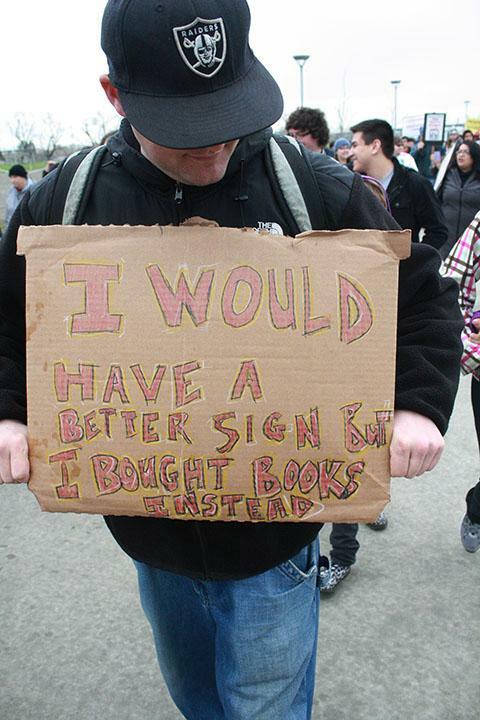 The only mention at the march by ARC about textbooks was the sign that I had made out of crayons. I had made the sign while sitting on the Light Rail heading to the march. The regional transit bus that I was on had a total of 24 empty seats, including the four spots for wheelchairs at the front of the bus. I got the cardboard for my sign for free and the eight-pack of “Pirates Treasure” Crayola crayons from Target for a whopping 48 cents. Several participants at the march came up and complemented me on my sign while others snapped pictures of it. Instead of asking for more money than they actually needed for the march, ASB should have instead asked for an amount more closely related to their actual costs. American river current co-editor-in-chief Ed Gebing carries his sign advocating for affordable education during the March in March rally on March 3. Be the first to comment on "Editor-in-Chief puts down his pen to lobby for students"